Microsoft Word was deleted from my computer many years ago, it possessed far more features than my needs required, and it’s ridiculously heavy handed interface was painful to use. Since then I’ve experimented with a number of different solutions, from the robust Nisus Writer to the simplistic Textedit. I also created prototype for a “universal text box” from which all data could be sent, much like Drafts 4 or Editorial on iOS today, but I lacked the programming ability to make it work. Eventually, I settled on BBEdit and Textmate for a long period of time for both writing words and mark-up. Then along came iA Writer and despite a particularly rough start, whereby it didn’t support Chinese, it has been my go to tool for writing text of all lengths ever since. I love the simplicity, the bundled typeface and the fact that I can open the app. on my iPhone, start typing almost immediately, come home, finish where I left off on my Mac, and later edit on my iPad. Markdown support means I don’t have to remove my hands from the keyboard. There is also the oft promoted concept of distraction free writing, which has value, but until you block Facebook, distraction is still only a keystroke away. There are a number of other subtle decisions they have made that make using the app. a joy, including how it saves with an automatic title in case I forget to. iA Writer is an important part of my workflow, enough so, that any email that requires a thoughtful response, beyond my usual short blunt replies, particularly anything written in Chinese, is first written in iA Writer. There are a multitude of dedicated note taking apps. which might be better suited to the majority of what I do, Notational Velocity, Evernote, and Apples bundled notes app. come to mind but I prefer to do as much of my writing in one environment as possible. Unfortunately, lately I’ve noticed a couple shortcomings with iA Writer which I surprisingly hadn’t noticed in the past. First, after you have written your document, you need to do something with it, save, send and print are the usual choices (“what can you do next” are natural questions you might record in testing). Unfortunately, iA Writer has extremely limited options in terms of where you can “send” the document. On the iOS version you can email the formatted doc. from within the app., which allows you to send it to Evernote or to an email recipient. Using the Mac version you can open the saved files in other software that supports the exported format. There isn’t a publish to services like WordPress or Evernote feature, which seems like an odd exclusion for an app. designed in an age where many never sent their writing to print. In iOS 8 you can use the open in service to send to Evernote but it’s saved as an attached file and unusable. Cut’n’paste is the quickest way to use the text you have written, but cut’n’paste is still painful in iOS. This in itself isn’t a deal breaker, but this lack of any real publishing options takes away from the overall utility of the software. Bug: an annoying new behaviour of hiding the text behind the extended keyboard. Second, and most disastrously, you cannot search text inside an iA Writer document. At least not using iA Writer and not using Spotlight on the Mac (Spotlight doesn’t index Markdown files). I realised this recently when I received an email thanking me for my interest in an opportunity, and asking to set a time to come to their company to discuss. Well, I didn’t remember sending an email to this person, but I did recognise a name in the email chain, and tried to search my past correspondence for any mentions. There were none, in fact no results appeared for any common search terms in iA Writers iCloud folder. I thought it was some bug in OS X, of which there are an increasingly large number of late, but iA Writer support graciously informed me via twitter that it was a limitation of Spotlight. They gave me a possible solution which didn’t work. On iOS you can’t search content inside a different app.’s database (one possible work around for iOS is to abandon iCloud and switch to Dropbox, thereby allowing others apps. access.) Siloing peoples data inside your app. seems like a huge mistake and judging by their support forum, it’s a mistake they don’t seem to be in any rush to rectify. iA Writer is not a good place to leave your data. Bug 2: Often when I use iA Writer on my iPad I can’t bring up the sharing options or open another file. The bottom and top areas of the interface disappear when writing but often don’t want to reappear. Only doing the iOS equivalent of a force quit brings it back. Because of this I have spent time looking at a number of different editors that support markdown, including: ByWord, iA Writer Pro (still no search), Typed, Desk, Daedalus and Ulysses. I use Evernote a great deal but have never really enjoyed using it to enter text, it’s more of a collaboration tool and data bucket for me. Byword wouldn’t work without internet connectivity the first time I opened the app., and there were some quirks with Chinese text. Importantly you can search! 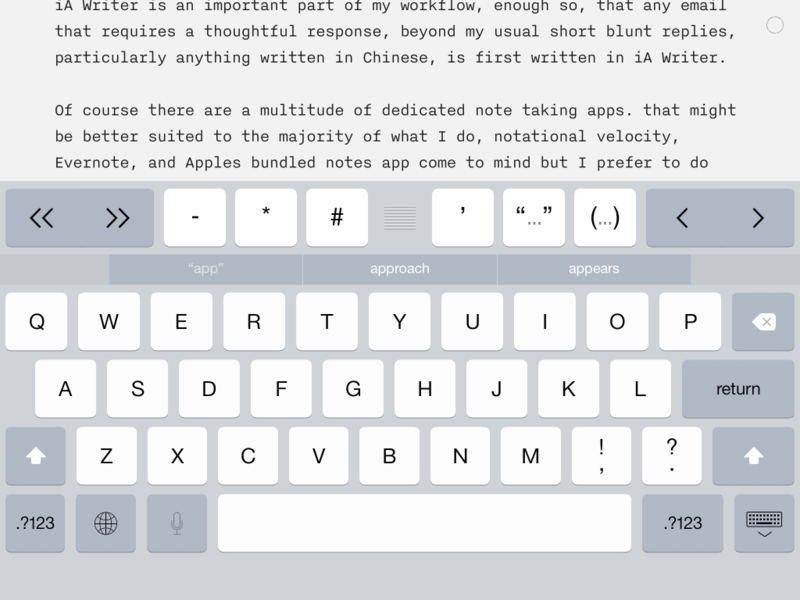 The publishing feature is great, if a bit unpolished, and will send your unformatted text straight to Evernote. If WordPress is your thing Desk on the Mac might be a better choice. It uses the default type choices on iOS which aren’t that great. 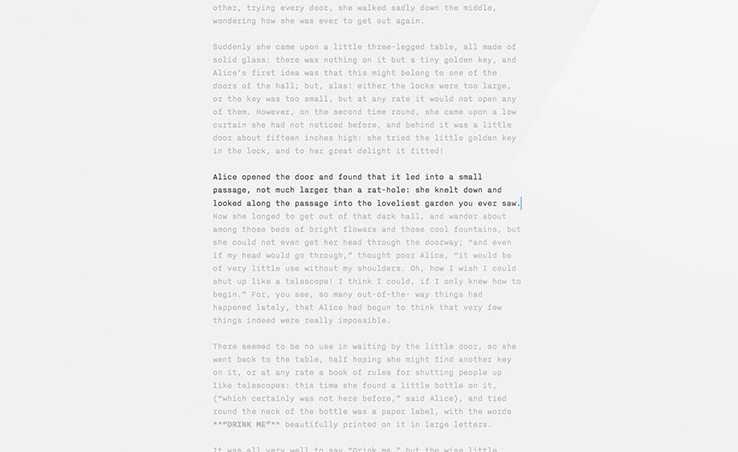 iA Writer Pro has a number of features that should be present in iA Writer, like night mode, plus adds a whole new workflow that at least initially places your files in different folders depending on the particular stage of writing you are in. The result tends to be confusion and even greater difficulty in finding past documents. Typed looks promising but there isn’t an iOS version at present. I’ve tried apps. with soundtracks that supposedly help you get in the zone and I personally don’t see the need. Seems like a distraction to both the writer and the developer. Desk is the one app. 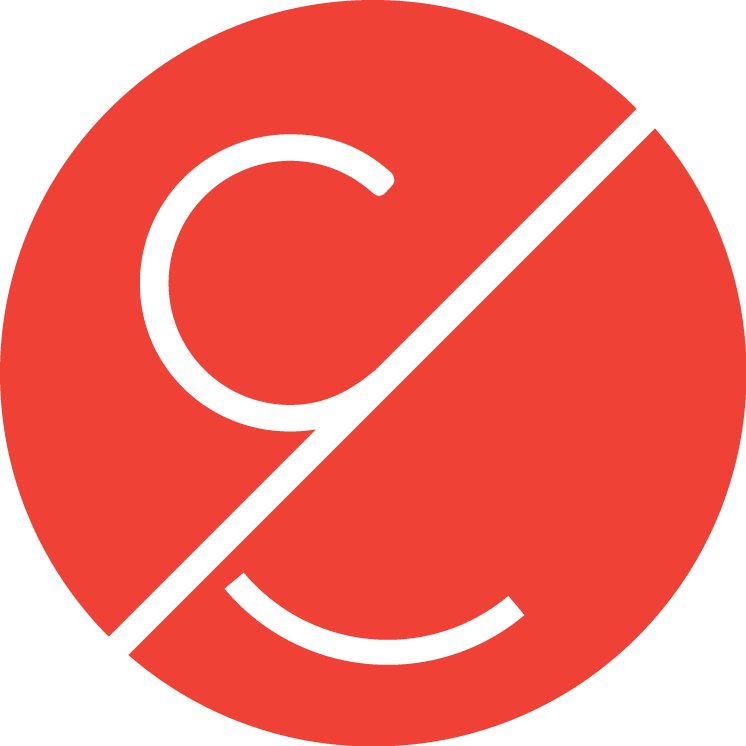 I haven’t tried but it does look very promising, especially with an enthusiastic developer and a growing community. Unfortunately there isn’t an iOS version and it’s current focus on WordPress makes it perhaps not an ideal choice. I will follow it’s development and recommend it to others when appropriate. Daedalus main purpose appears to be as an iOS partner to Ulysses with a mental model of how to treat document management even more obtuse than iA Writer Pro. I wanted to like it but felt it’s forced metaphor got in the way. Ulysses is far more extensible than my needs require but the complexity of the tool can be easily hidden. It’s extensive export options could prove to be valuable. Unfortunately it too doesn’t support web services, nor does it have iA Writer’s Nitti typeface, but there are work arounds. Importantly it supports full text search, including iA Writers files on iCloud, which may allow me to continue to use a different solution on iOS. That will mean I won’t be able to use apples oft touted “hand-off” feature but I have yet to see that work in any real world use case. It’s truly a wonderful app. to use. Since I started writing this short piece, iA Writer for Mac has been updated with the ability to add links using Markdown. I love this stripped down approach to software, just adding what is absolutely necessary and not trying to appeal to all possible use cases. The fact that so many developers agree is great as it gives a range of choices. While I am still rooting for iA Writer to fix the above mentioned problems, it’s now a toss up between Ulysses and Byword, which though designed towards different needs, seem to both work well for me. Anyone can design experiences, the difficulty lies in designing and creating great user experiences – the latter requires a variety of disciplines and skills. This can prove difficult as we see departments and disciplines fighting over ownership of the ‘customer experience’ from design and IT through to marketing and branding. But designing great experiences is a team sport requiring responsive rugby squads rather than process driven relay teams. In this presentation Leslie will discuss why UX teams should look beyond the obvious UX players and create cross-departmental rugby teams. When we put time and effort into something, we’re motivated to make it work. We therefore often continue to invest into it even if it brings us losses. Examples include continuing to pump money into a failed business idea, or attending a play when sick only because the tickets were pre-purchased. Arkes, Hal R., and Catherine Blumer, “The psychology of sunk cost”, Organizational Behavior and Human Decision Processes, Vol. 35, No. 5, December 1985, 124-140. This characterises so much of my behaviour, from continuing to invest in Chinese studies, despite seldom needing anything above a very rudimentary level, to continuing to doggedly insisting on being an entrepreneur, despite not possessing the required capital, human or otherwise (I suppose continuing to live in Taiwan counts too).